Before you start a home renovation, read this. It takes careful planning, saving and budgeting to be ready to renovate your home. But the next step you take — hiring a contractor — might just be the most important. That’s because a good one will help turn your dream into reality, while a not-so-great one can give even the toughest person a headache. TODAY Home asked some homeowners to share the good, the bad and the ugly about working with a contractor. Here are 13 lessons they learned along the way. For more tips, tricks and advice right in your inbox, sign up for TODAY's Everyday Solutions newsletter. 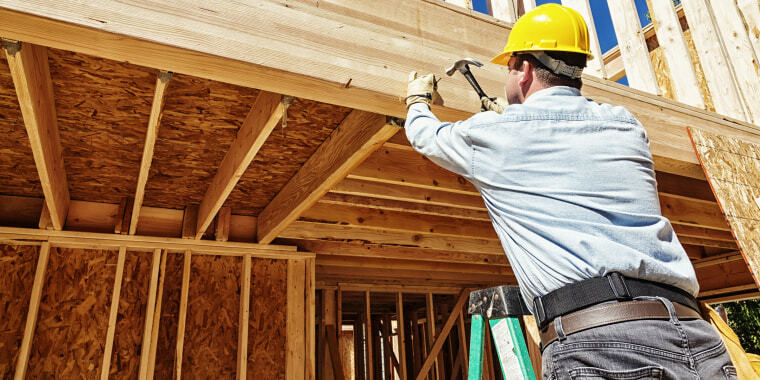 When it comes to hiring a contractor, it pays to do your homework. Ask friends and family for names of contractors they have worked with, then interview the top few candidates. Take note of how they bid the job, how they propose working with subcontractors and whether your personalities mesh. Call their references and, if possible, check out their work firsthand. 2. Verify the contractor’s license and insurance. If the contractor is working in your home, make sure he or she is licensed for residential jobs. When Giavotella called the state regulatory office, they said the contractor had a clean record — for commercial jobs. But a deeper dig revealed there the man was no stranger to lawsuits for his subpar work. 3. Set a professional tone from the beginning. Yes, he's going to be in your home a lot, but resist the urge to be buddy-buddy with your contractor. Be clear from the very beginning that you have a specific vision for the project and expect the job to be done well. Keeping things consistently professional makes it easier for you to push back and speak up when the work doesn't meet your expectations. 4. Consider an emergency fund. Give yourself a little financial breathing room by building in a small cushion (an extra 20 percent of your total budget, if you can swing it). The contractor's job is to stick to your budget, so it's up to you to decide whether to disclose your reserve money. 5. Get everything in writing. Everything. A paper trail is key, since it protects you and your contractor. Put all the details about the project — including a start date and an end date — in a contract and have an attorney review it before you and your contractor sign off on it. As the project gets going, put any changes that come up in writing, initial it and print out an updated plan for the both of you. Also make sure your contractor spells out all the survey and inspections required by law and keep a copy of the corresponding reports, says Giavotella. 6. Be very clear about what you want. 7. Discuss cleanup before work even begins. Communicating your expectations will help prevent scuffed walls, dust-covered furniture and damaged floors when the project is in full swing, and stray nails, broken glass and other dangerous remnants when it’s over. Though cleanup was part of the quote, Gandini’s contractor left their home in disarray. 8. Take your own measurements and compare them to your contractor's before ordering. This is especially true for tile, carpet and wallpaper, which contractors tend to overestimate, leaving you to pay for the unused extras. 9. Buy the supplies yourself, if possible, or at least accompany the contractor to the store when he or she is buying the supplies. Sometimes, less-than-reputable contractors will buy the cheapest materials they can to get the job done and hope to sneak it past unsuspecting homeowners. Unless you’re familiar with what your contractor is buying, it helps to go to the store with him to make sure he’s stocking up on the supplies you want. 10. Watch the job site like a hawk. Plan on checking in with your contractor often and ask for regular progress reports. Try to be on site as much as possible so you can spot — and shut down — problems as soon as they crop up. "My contractor didn't pay attention when I told him the back exterior brick wall looked wet," said homeowner Jeff Giavotella. "Turns out, the balcony roof on the second floor wasn't completed and water was pouring behind the wall. The contractor had to rebuild the walls three times before he finally got it right." “The very first day of the job, the subcontractor brought in homeless people he had hired to work in my house,” said Michelle Gibbs, a New Orleans homeowner. “My contractor had no idea who they were. When a neighbor walked in to do some work on my security system, he found two of them getting busy in my closet! So the subcontractor replaced them with an alcoholic who ended up hiding bottles of whiskey in the pockets of my coats and around my backyard and stealing three pairs of my shoes." 11. Eyeball the progress every day. Every night, when the workers close up for the day, go through the area being worked on and make sure everything is up to snuff. Flag any problem areas with sticky notes and call them to your contractor's attention the next morning. Take photos of the work in progress so you have a physical record of it. Keep in mind that some things can slip past even the most vigilant homeowner. “My husband would check in daily and look at the work that had been done that day on our house,” Rodriques said. Unfortunately, the licensed contractor they hired cut corners, and it wasn’t long before his shoddy work literally fell apart. The railing fell out of the wall while her husband was walking down the stairs, even though it had been redone three times already. “And one of the banisters came off in my hand." 12. Withhold final payment until work is complete. Homeowners and the Federal Trade Commission agree that it’s wise to keep your down payment to a reasonable number, make subsequent payments contingent on work completed (this should be spelled out in your contract) and withhold the final check until you’re absolutely certain the job is done to your satisfaction. 13. Keep a poker face during the final walk-through. You'll be so excited that the job is finished, chances are you'll overlook smaller imperfections. Try to stay as objective as possible during the final walk-through and keep your emotions — good or bad — in check. This article was originally published on Aug. 13, 2014 on TODAY.com.